My computer is a iMac (20-inch, Mid 2007). The model identifier is iMac7,1. The processor name is Intel Core 2 Duo, which means I have a 64 bit machine. The Apple web site Boot Camp: System requirements for Microsoft Windows operating systems shows the only downloadable Boot Camp support software for my Mac is for the 32 bit version of Windows 7. I can successfully install the 64 bit DVD installation versions of Windows 7 and 8 on my machine. The problem I am having is with the Boot Camp Support Software 4.0.4033. When I follow the instructions and double click on setup.exe, I get the following popup. How do I successfully install this support software and avoid this popup? This has been tested for Windows 7, 8 and 10. These are the instructions for a Windows 7 Professional Service Pack 1 (64 bit) installation. Here, I assume the Boot Camp Support Software 4.0.4033 has been copied to a flash drive. The instructions were adapted from the originals given here. 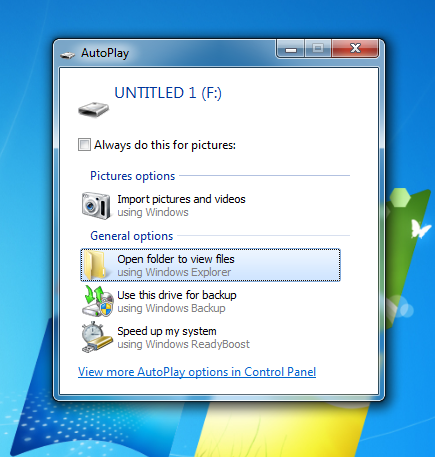 Determine the drive letter of your flash drive, by inserting the drive in a USB port on the Mac. Below is an example of the expected popup. This image shows F: as the drive letter. Your drive letter my be different. You can close this popup. Open a Administrator Command Prompt window by left clicking the Start button, left clicking All Programs, left clicking Accessories, right clicking Command Prompt, and then left clicking Run as Administrator. When prompted to allow changes, click on Yes. The window should appear as shown below. Assuming F: is your flash drive, change your working directory by entering the following command in the Administrator Command Prompt window. Be sure to replace the letter before the : with the drive letter of your flash drive. 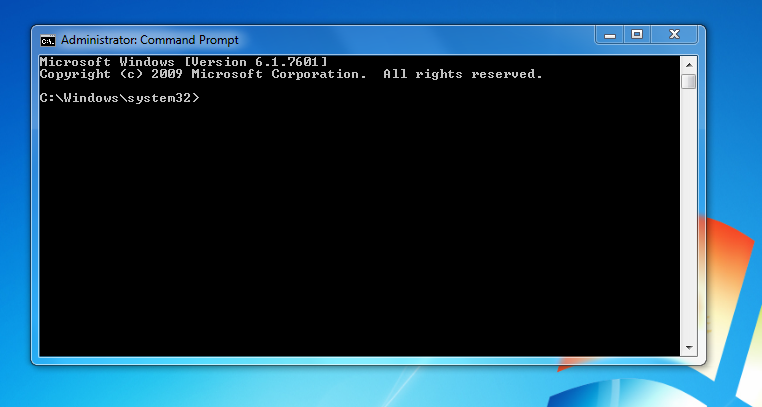 In the Administrator Command Prompt window, enter the following command to start installing the Boot Camp Support Software. Installation can take a few minutes. Don't interrupt the installation process. When installation is complete, click Finish in the dialog that appears. A system restart dialog box appears. Click Yes to complete the installation. Not the answer you're looking for? Browse other questions tagged bootcamp windows windows-7 windows-8 . Which version of Windows will run on an iMac 24" early 2009 model? How to get a clean install of Windows 10 to activate? Old MacPro (2,1) with Windows 7 runs extremely slow? Why a Win 7 usb installer made using Boot Camp, is not working? Why will BootCamp not work on my 20" iMac 9,1? Can I get drivers to run Win 7 64 bit on a MacBook 2.1 manually? Why can't I download the latest Boot Camp installer when first configuring Boot Camp? How to prevent Windows 10 from downloading and installing updates before the Boot Camp Support Software is installed? How can I install Windows 10 64-bit in El Capitan Boot Camp? How do I reinstall Apple Software Update in Windows?